This sponsored post is in partnership with Baby Born Surprise. Thank you for supporting the brands that help make Bubby and Bean possible. Between having two kids in preschool and the developmental therapy that my son Emmett received as a baby and toddler for his epilepsy, I’ve learned a lot about the different things that affect a child’s development. Most of them have little do with academics and more to do with play. One of the things that the development therapist talked a lot about to us was the many ways that playing with dolls can have positive effects on littles ones as they grow. Both my kids love nurturing and playing with their dolls, but my daughter especially enjoys it. This, of course, makes me really happy, because it’s a double win to see her having so much fun with toys that I know are good for her. 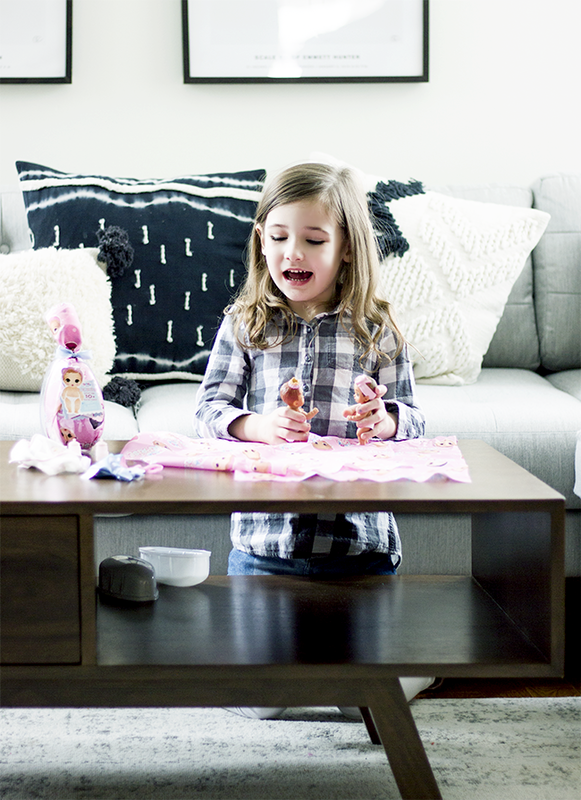 I know many of your little ones enjoy playing with dolls as well, so I’m very excited to be teaming up with Baby Born Surprise, Essley’s current favorite dolls, to share some of the ways that playing with dolls can be beneficial. 1. Playing with dolls helps develop children’s imaginations. Any kind of dramatic play – which is exactly what kids are doing when they play with dolls – helps develop a child’s imagination. I watch both of my kids come up with elaborate pretend scenes and situations with their dolls, both alone and together, that are not only endearing (and often hilarious), but also incredibly creative. 2. Playing with dolls together (child and parent) helps set up success for future relationships. Like most families, we are always busy. Taking the time to play together, especially with a child’s favorite toys (like my daughter’s Baby Born Surprise dolls), creates bonding time together that will ultimately help them in their relationships and social skills as they grow. When I first got these adorable dolls for Essley, we sat together as she unboxed them. (Surprise toys are her absolute favorite!) It was exciting for both of us to unwrap the bundles of surprises together and discover the cutest swaddles (a mermaid, a pink poodle, and a white bunny), the dolls’ eye colors (two blues and a “green like mommy!”) and darling hair colors/styles, and their fun color changing diapers. We then filled out the birth certificates each doll came with and played the games on them, and just spent some quality time together playing. She told me that night before bed that it was the best day of her life, so I’d say our bonding time was a success. We have continued playing with her Baby Born Surprise dolls every day for the last couple of weeks. It’s pretty awesome to know that our time together is also establishing a foundation for her future relationships. 3. Playing with dolls helps children learn empathy and compassion. 4. Playing with dolls teaches children about the world around them. Play in general is how children discover the world around them and learn skills that they’ll practically use in the future, and role playing with dolls is one of the best ways to do this. My daughter has three Baby Born Surprise dolls, and loves to act out scenarios where they’re sisters going about daily life. She has so much fun doing this, but subconsciously, it is also preparing her for the real world. 5. Playing with dolls can help children with fine motor skills. The act of playing with hands on toys like dolls can help develop and improve a child’s fine motor skills. I watch my daughter use her hands and fingers to carefully swaddle and unswaddle her Baby Born Surprise dolls, feed them with their little bottles, and change their little diapers, and know that in addition to her having fun, she’s working on her fine motor skills without even knowing it! 6. Playing with dolls helps children to learn about emotions and feelings. I remember my son’s developmental therapist talking about how children often express or work through emotions through their dolls, which is an important way for them to learn about their own feelings and the feelings of others. Both of my kids use their dolls to act out emotions from sadness to joy to grumpiness, which is subconsciously helping them learn to express their own emotions in healthy ways. I have to say, one of the most interesting and magical parts of being a parent for me is discovering just how much my kids are learning and developing through everyday play. If your little one enjoys playing with dolls like mine do, I highly recommend getting them a Baby Born Surprise. It’s been such a pleasure to see how much my daughter adores playing with hers. And if you know of other ways playing with dolls benefits a child’s development that I might have missed, I’d love to hear about it!